"Finally, a computer game that captures the look, feel, tension and fun of the classic board game it is designed to emulate! Axis and Allies: Iron Blitz Edition is not merely a computer version of the classic Axis and Allies board game; it IS the game - and a lot more. Bill Levay and the rest of the design team at Hasbro's MicroProse division kept the "play" in "player" in mind when they put this project together. Their attention to detail, ease of operation and knowledge of the fine points that have made Axis and Allies a great board game are evident on every level of play. The classic Axis and Allies (now version 1.33) is a very solid, easy-to-play computer version of the board game. The time is early 1942. The world is at war. France has been conquered, Russia has been invaded and Pearl Harbor has been bombed. There are five countries in two alliances (the United States, United Kingdom and USSR are the Allied, and Germany and Japan are the Axis). Each country, in fixed order, will spend money on weapons research and new units. It will then move, fight and conduct post-battle moves. It will then place the new units it built at its factories, and collect its income. This process repeats each turn until one of the victory conditions agreed upon at the start of the game have been met (either the conquest of two enemy capitals, or the attainment of a majority of the income-producing territories on the board). Iron Blitz adds new units and some new rules to the original game, but it does not significantly change how the original, classic game is played. The computer players retain the same strengths and weakness (and strategies) from the original Axis and Allies board game. Where Iron Blitz really takes off, however, is with its seven new scenarios and its editor. These add new scenarios, new balancing, and new challenges that will keep players coming back to fight the computer (and other people) over and over again. The Cold War scenario shows what can be done with the game editor. The rules booklet provides extensive information and ideas on how to change the ownership, colors and values of the map, how to import player-provided icons for units, and how to make new games by either tweaking the existing games and scenarios, or by creating a campaign pretty much from scratch. The simplest way to make a new game is to mix up the composition of the Axis and Allies teams. There can be a Nazi-British "Europe Against the World" team or a Japanese-American "Pacific Alliance" against the three European continental powers, or some mix thereof. 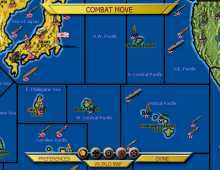 This setup, or one of the classic/scenario games, can be modified by giving or taking away units or by upgrading or modifying some or all units of one or more countries. There are many rules that can be added or deleted as well (like the two-hits-to-sink-a-battleship rule, or Panama as a single zone for movement option, just to name a couple). The possibilities are pretty much endless (? ), however, this reviewer would suggest that the player take some time and work it all out on pen and paper (or with the real board game at his side) before opening this electronic toy box. Whether alone or with a hot-seat friend, Axis and Allies: Iron Blitz Edition is everything the board game was, and a little more. Most importantly, however, it is still a great box of toys, albeit electronic ones." A must-have, and a worthy induction into our Hall of Belated Fame.